July 5, 2017 April 2, 2019 - The 'Noms. 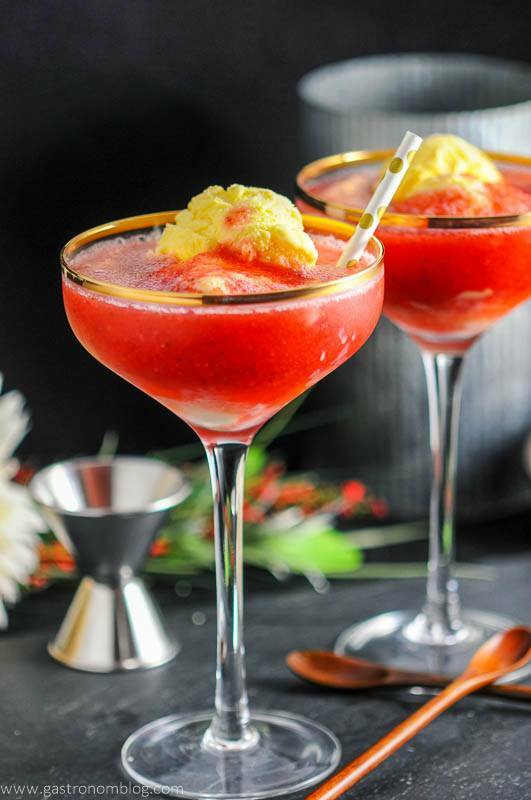 A refreshing sorbet and rosé float wine dessert and cocktail all in one! This summer we have totally been into all sorts of frozen drinks and desserts. They are somewhat of a departure from our typical drinks, but with the hot weather, serving anything frozen and frosty is going to be delicious! 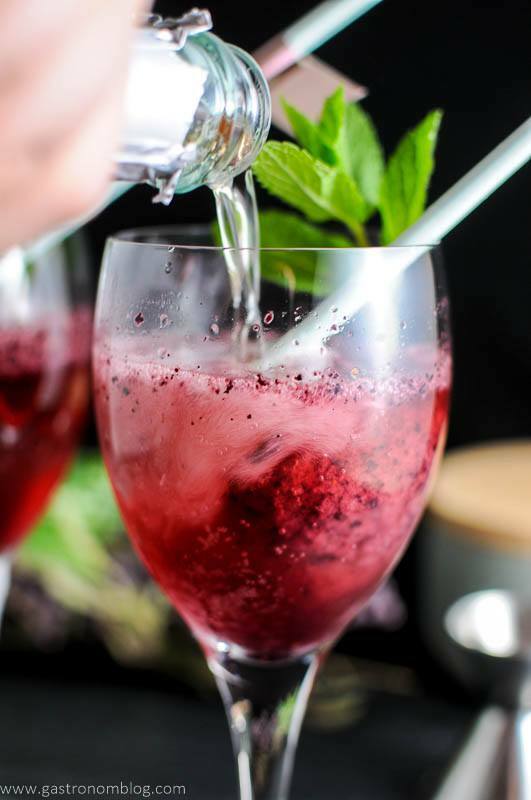 Our Blueberry Mint Sorbet Sparkling Rosé Float checks both the dessert and the drink box off the list, which is why this delicious fruity, frozen and fizzy float is tops on our summer sippers list! This post contains affiliate links for products that we think you as readers might find useful, and we make commission off of these! For more details about our affiliates, click our Disclosure and Contacts Page. Over the last few summers we have been experimenting with all kinds of frozen treats, from delicious boozy popsicles to creamy no churn ice cream made with beer. it was only natural that this summer we had to find some new frozen treats. We have been having some incredible luck with fresh berries this summer, and when had a great batch of blueberries that were just begging to be made into something delicious, we decided to make a fresh blueberry mint sorbet. What is a sorbet? When most people think of a sorbet, they start thinking about sorbet’s close cousin sherbet, but there is a big difference. 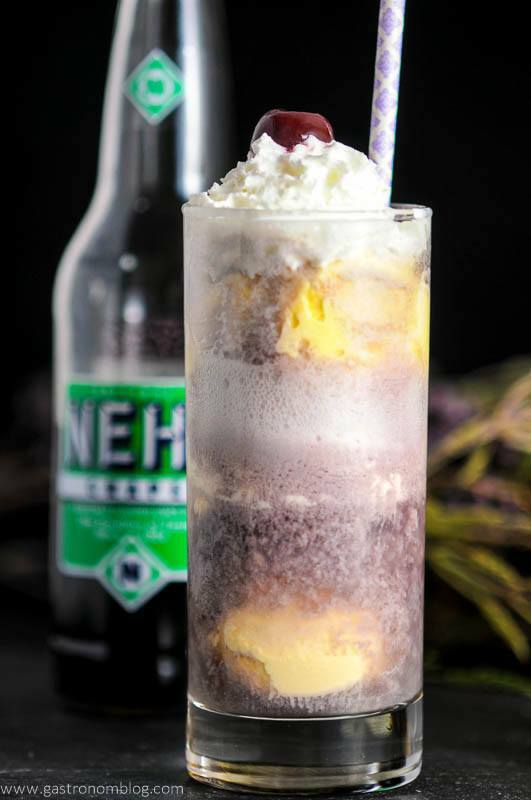 Sherbet is made with a combination of fruit juice and cream, and sorbet is made by using fruit or fruit juice and sugar syrup which results in a denser more flavorful dessert. In our case, we used some of the those fresh blueberries and some of our spring mint to make our sorbet. We started out by freezing the blueberries until they were solid. While we were waiting for the berries to freeze, we made a little fresh mint simple syrup. 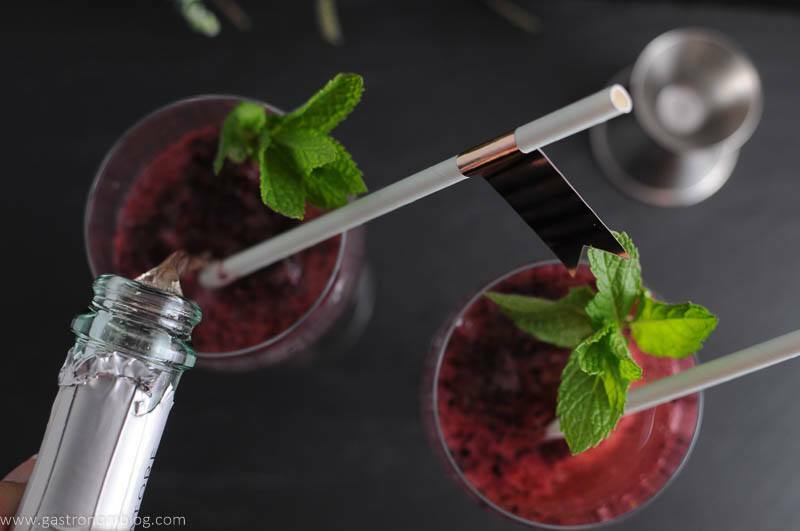 The mint simple syrup brings a combination of sweetness and refreshing cool herbaceous edge to the table. Blueberry works really well with herbal flavors so this is a fantastic flavor combination. Once the berries were frozen, we blended them in a food processor with a little fresh squeezed lemon juice and a whole bunch of the mint simple syrup. Once fully blended, we placed the sorbet back into the freezer to “ripen” until it firmed up. This step isn’t entirely necessary, if you just can’t wait, this sorbet is great right out of the blender! 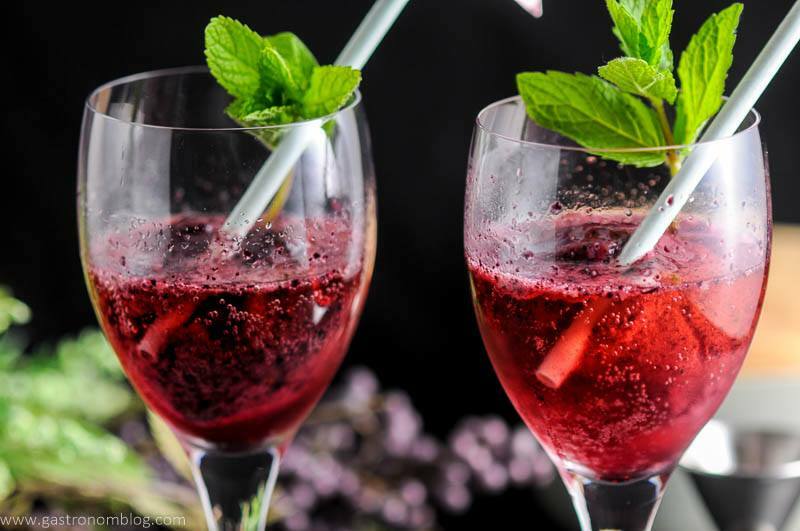 What Ingredients are Needed for the Blueberry Mint Sorbet Sparkling Rose Float? While the sorbet is fantastic on its own as a dessert, we are cocktail bloggers after all, so we couldn’t just stop there. We had previously been experimenting with some different types of rosé (sweet, dry, and sparkling) for another recipe (our delicious Watermelon Raspberry Frosé) so we had a bottle of sparkling rosé in house that was just calling our name to use. The bottle of sparkling Rosé was a nice semi sweet sparkling wine. It was one that would work really well with with a nice fruity flavor. How to Make this Extra? 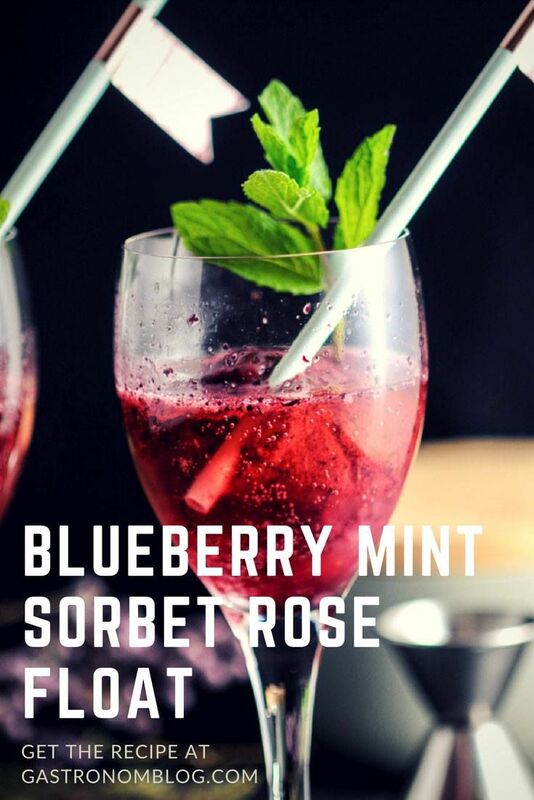 We are big fans of drinks like mimosas and bellinis, so we figured why not combine our bottle of Rosé and our Blueberry Mint Sorbet to create a nice frozen fruity and fizzy cocktail? 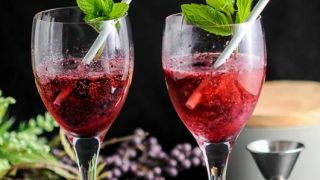 The blueberry mint sorbet would bring a nice chilled fruity sweetness that would also act as the base to release the bubbles from the sparkling Rosé. When you add the sparkling Rosé to a glass containing a scoop or two of the Blueberry Mint Sorbet, you get a nice foamy and fizzy Sorbet and Rosé float! 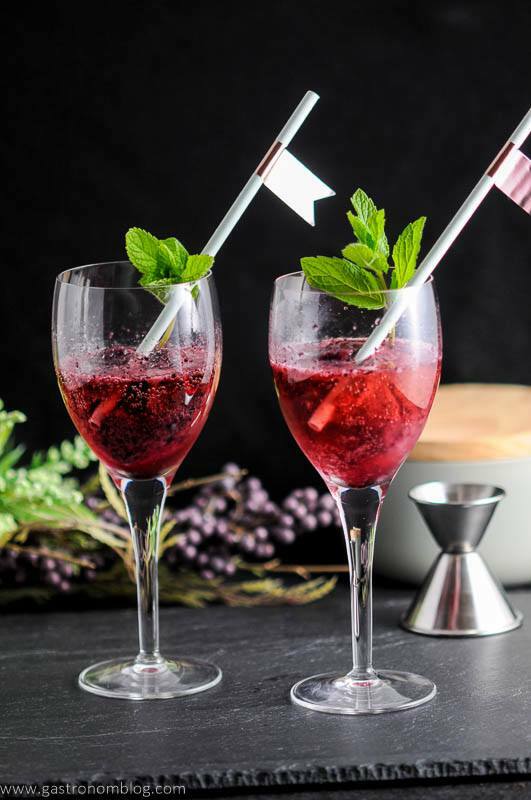 Simple, sweet and fruity, the Blueberry Mint Sparkling Rosé Float is sure to become one of your favorite summertime sippers! Like this recipe? Try these below, too! Also, don’t forget to follow us on Instagram and tag #gastronomcocktails so we can see all the wonderful recipes YOU recreate from this site! You can also subscribe to our weekly newsletter so you never miss a delicious recipe again! Dessert and cocktail all in one, homemade blueberry mint sorbet topped with a sparkling rose wine. Add scoops of sorbet into a large wine glass. Spread blueberries on a cookie sheet. 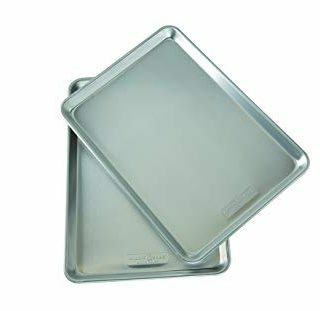 Place the cookie sheet into the freezer and freeze blueberries until solid. 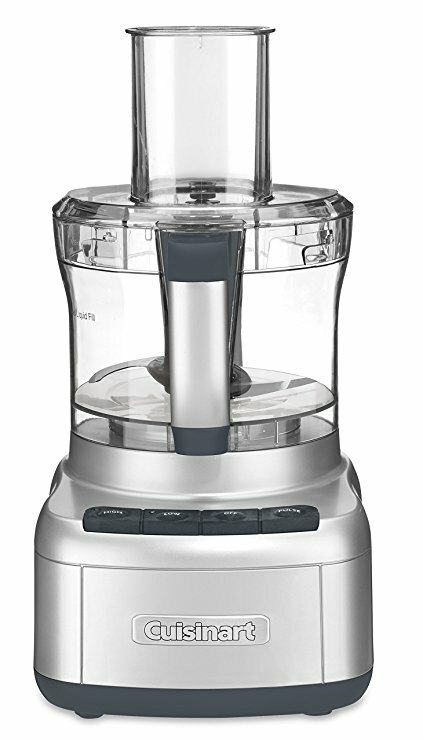 Place frozen blueberries into food processor. Add simple syrup and lemon juice. 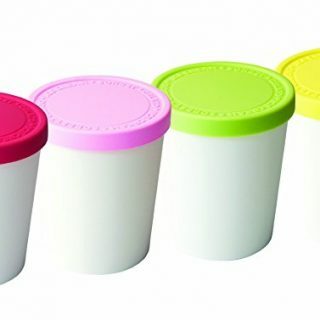 Place into a sealable container and allow to re-freeze to solidify. 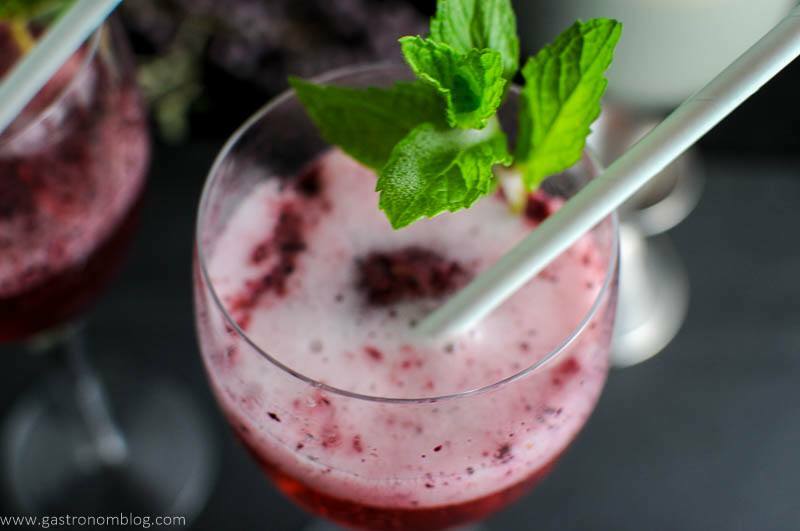 PIN THIS BLUEBERRY MINT SORBET FLOAT RECIPE FOR LATER! Interested in stocking your own home bar? Make sure to see our favorites at our Amazon Store! If you liked this recipe, don’t forget to subscribe for new (and of course free) recipes by entering your email address on the side bar (and get all the recipes delivered to your inbox when we post), so you don’t miss out on a thing. You can find us on Facebook, Instagram, Pinterest and Twitter! With the heat wave we’ve just had, this looks more than inviting! Yum! Going to have to try this! Thanks, hope you do! Cheers! This looks like such a fun drink for summer! 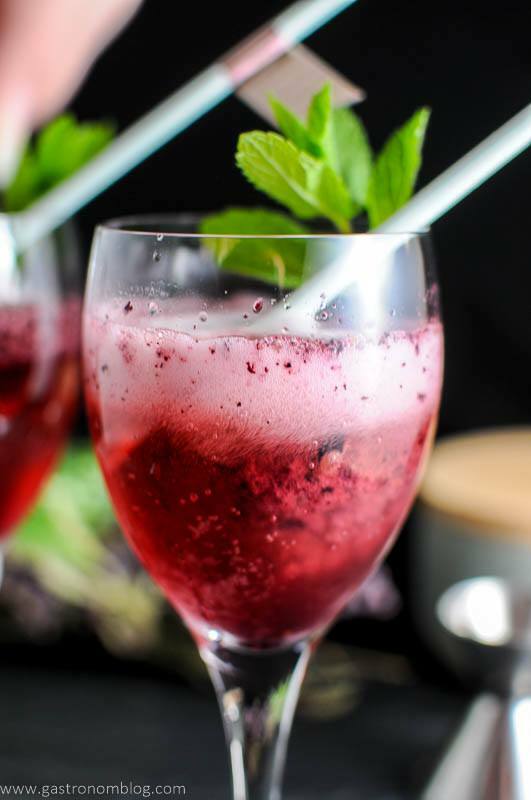 Love the blueberry mint combo, and adding sorbet to sparkling drinks is such a fun idea! Thanks so much! We loved this combo, and it’s like dessert and a cocktail all in one! This is definitely something that I am going to try! Thank you, hope you do! Cheers! Are you using regular mint? or a more specialized mint? Looks so bubbly! What about trying a drink with the delicious bing cherries that are hitting the market? Just regular mint! Jay would love a cherry drink! This looks so good and refreshing. Pinning for later. This recipe looks so delicious and refreshing! Going to try this soon– it’s the perfect drink for summer. Thanks so much! We thought it would be a great refreshing summer drink! sorbet and rose?! You are speaking my language! yum! Thanks! It’s a great combo! Cheers! If nothing else this is absolutely gorgeous! Very pretty styling. This look so so yummy & refreshing! We love those kinds of drinks too! Adding some Prosecco might be a good addition too! Thanks so much! I think any bubbly wine will be perfect, cheers! This look fabulous and refreshing! Count me in for all things rose during the summer! Thanks so much! Isn’t it such a great treat in the summer? Leah that recipe sounds incredible!! Have you ever heard of “Hugo”? It’s a drink that is really popular here in Austria and Germany right now 🙂 It is quite similar but with elderflower syrup! Thanks for sharing this, I will make this on the weekend! Thanks so much! You have intrigued me with this “hugo”! I need to research that one, cheers! I think this will have to be on our list for the next time we have Rose! Wow I love this! Will definitely be trying this this summer! Thanks so much! Hope you try it out! Cheers! Um, YUM! This looks absolutely delicious! I need to try this before summer rolls around again! Thanks so much, hope you do! Cheers! 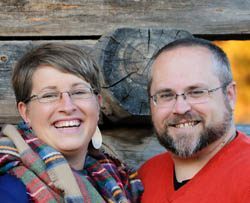 Hi, we are Jay and Leah, a couple who love to share our love of cocktails, great food, restaurants and spirited travel! All Content Copyright The Gastronom 2012-2018 All Rights Reserved Other use permitted only with expressly written permission.